Standing and walking on paved and gravel paths with easy to moderate inclines. The more physically fit may opt to walk down into the river at Moore State Park for more daring shots, but this is not required. 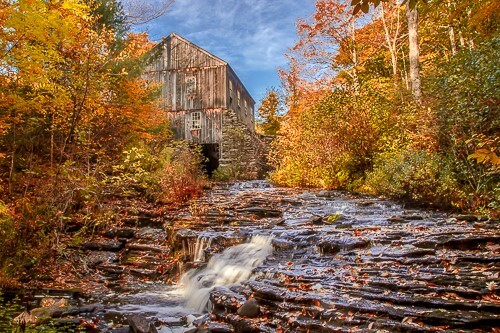 The workshop starts at 8:30 AM and the meeting location is the free parking lot for the Grist Mill in Sudbury, MA. You can use the address 72 Wayside Inn Rd, Sudbury, MA with GPS coordinates of 42.3576 N, -71.4741 W.
David will be at the small set of stairs leading down to the mill with his tripod up. If you are a beginner and would like to participate in an introductory Q & A on photography, please arrive by 8:00 AM.